Before Saturday, only one school had ever won three mixed state paddling titles in a row. Add Seabury Hall to the list. 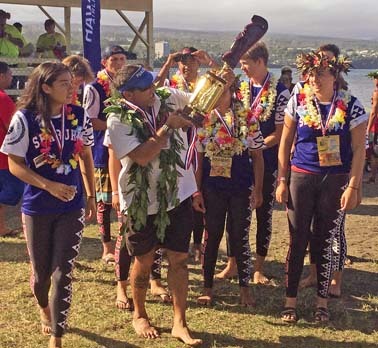 The Spartans, relegated to runner-up status in the Maui Interscholastic League by Kamehameha Maui, won their third straight state crown on Saturday afternoon in the Hawaiian Airlines Canoe Paddling Championships at Hilo Bay. The Warriors finished second. The MIL 1-2 finish came after Punahou crossed the finish line first but was disqualified for burying their turn flag in the half-mile race. “I feel bad for Punahou, but that’s why they race the race, right?” Luuwai said. 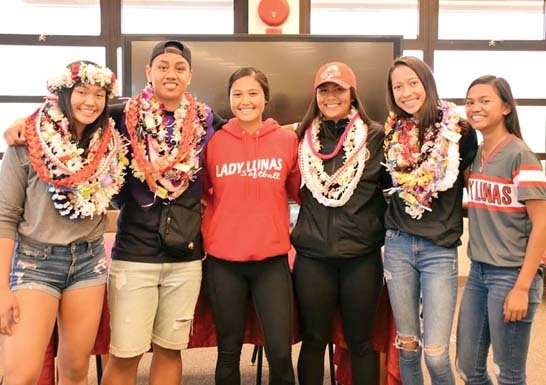 The Spartans’ crew of Taysia Pimentel, Kai Ponting, Kainalu Kubo, Dylan Newbro, Shea Stisher and Kaya Givensel were there to claim the crown. It is the third straight state mixed titles for Pimentel, Givensel and Kubo. Pimentel and Givensel each won their fourth state gold medals, more than any other female paddler in state history, according to statistics provided by Jerry Campany of the Honolulu Star-Advertiser. Seabury Hall joins Kamehameha Kapalama as a three-peat state mixed champion — the Warriors won three straight state titles from 2011 to 2013. The Kamehameha Maui crew finished second in their preliminary heat to Punahou and chose lane 4 for the final. The Warriors’ time was faster than what Seabury Hall had in winning its heat, but the heat winners were afforded first lane choices. The Spartans chose lane 2 after Punahou chose lane 1 — both MIL coaches said the inside lanes were running significantly faster on Saturday. Kamehameha Maui coach Robert Brede said he took his top three boys — Triston-Hookele Santos, Rafael Adolpho and Joshua Kailiehu — out of the boys race to join Healani Tolentino, Liana Vasconcellos and Hoala Alapai for the mixed final. “It’s been a roller coaster,” Brede said. The Spartans boys finished second and the King Kekaulike girls took third, one spot in front of Kamehameha Maui. 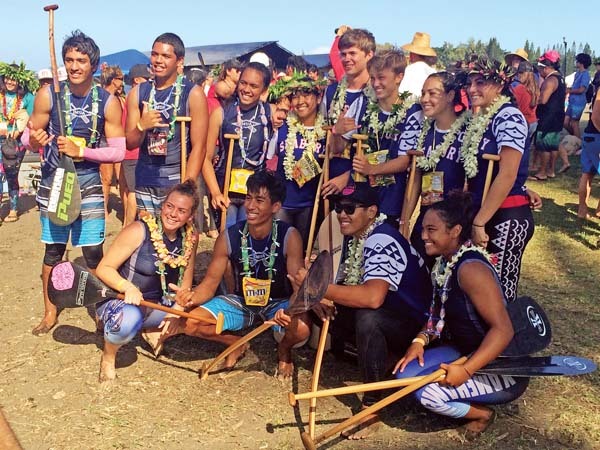 The Kamehameha Maui boys placed seventh and the Molokai girls finished eighth. Girls–1. Punahou (Dillyn Lietzke, Olivia Klem, Kaya Lee, Mehana Leafchild, Pomai Ogata, Grace Blanchette) 4:16.64, 2. Kamehameha Kapalama 4:23.09, 3. King Kekaulike 4:32.54, 4. Kamehameha Maui 4:34.40, 5. Pac-Five 4:34.89, 6. Kalaheo 4:36.69, 7. Kea’au 4:39.14, 8. Molokai 4:39.88. Boys–1. Punahou 3:45.10 (Riley Lathrop, Gabriel El Hajji, Trevor Hemmings, Isaac Miller, Aukina Hunt, James Morris), 2. 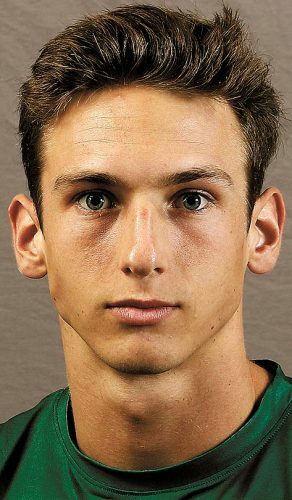 Seabury Hall 3:48.59, 3. Kalaheo 3:50.76, 4. Kamehameha Kapalama 3:55.57, 5. Anuenue 4:05.09, 6. Mid-Pacific 4:09.69, 7. Kamehameha Maui 4:27.94. DQ: Hawaii Prep. Mixed–1. Seabury Hall (Taysia Pimentel, Kai Ponting, Kainalu Kubo, Kaya Givensel, Shea Stisher, Dylan Newbro) 3:57.76, 2. Kamehameha Maui 4:02.61, 3. Kea’au 4:06.50, 4. Kalaheo 4:09.16, 5. Iolani 4:10.04, 6. Waialua 4:10.49, 7. Kaiser 4:15.27. 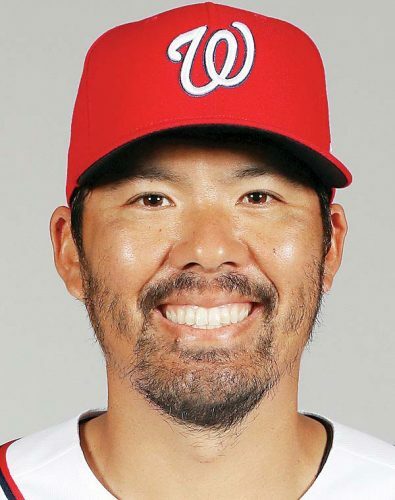 DQ: Punahou.